LBDNA Menu – Click the area to explore. 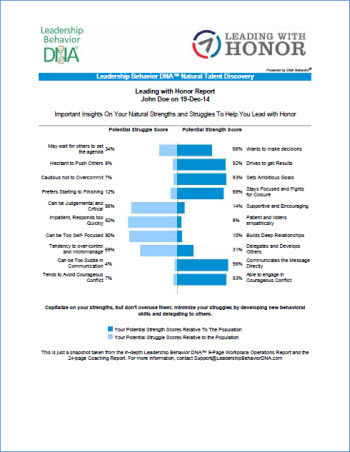 Want to take a free look at Leadership Behavior DNA? Take 10 minutes to get instant access to your personal LBDNA Discovery Report. Want to know more about LBDNA Report Services and Training? Contact Us for a custom proposal. Note: The information collected in this form by Leading with Honor, LLC is used to contact you directly and will not be shared with any third party.